(Newser) – After more than a decade of international efforts to combat the narcotics trade in Afghanistan—depriving the Taliban of funds in the process—the country is now producing more opium than ever before, a UN reports funds. The harvest this year resulted in a staggering 6,000 tons of opium, 49% higher than last year and more than the combined output of the rest of the world. Even Afghan provinces with some past successes in combating poppy cultivation saw those trends reversed, according to this year's UN Office on Drugs and Crime report. The very title of the article tells the entire story. If it's a “record crop” now, that means it was less, much less, before. When the “evil” Taliban were in charge, opium poppy growing was minimal. With not a square inch of land not being tromped on by U.S. soldiers, poppy growing is at a maximum. Aren't any of the soldiers reporting the poppy fields they see growing? Don't they spot any of those from their Predator drones? The fact is there is no way not to assume that arranging a bump3er crop was the sole reason for invading Afghanistan. And, since that came on the heels of the provably suspicious “September 11” incident that was all a fraud, an engineered event and the U.S. government cooperated in it. It was my understanding that poppy production dramatically increased after the U.S. invasion of Afghanistan. 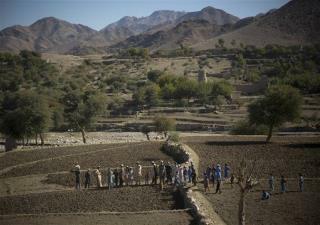 The Taliban were destroying crops and production was at an all-time low before U.S. intervention in the region.